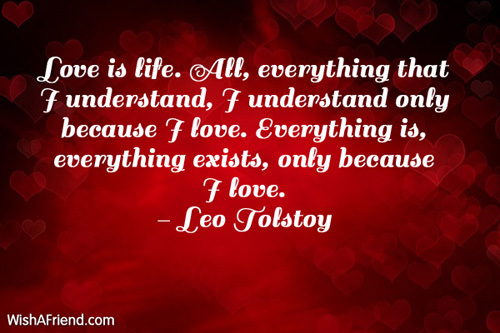 Leo Tolstoy Quote: Love is life. All, everything that I understand, I understand only because I love. Everything is, everything exists, only because I love. Browse our collection of Valentine's Day quotes and sayings. Share Valentine's Day quotes with friends and family. Love is life. All, everything that I understand, I understand only because I love. Everything is, everything exists, only because I love.